German and Bayern Munich football fans woke up on Sunday to expressions such as “crying”, “bad luck”, “nightmare”, “maximum punishment” and “devastated” in German media in the reporting reaction to Bayern’s 5-4 penalties loss to FC Chelsea in the Champions League final. Distraught Bayern fans found plenty of condolences in the German media after drowning their sorrows the night before as they watched Munich fail to take advantage of a slew of chances and ended up being devastated by the gods of football – and all that with the dream of winning the Champions League title in their home arena. “Champions League Drama: Bayern lost in penalties thriller: Schweini, we are crying with you!” headlined the mass daily Bild their coverage – focusing on Bayern star Bastian Schweinsteiger, who watched his penalty – Bayern’s final attempt – blast off the right upright before Didier Drogba nailed his spot kick to give Chelsea their first title. Bild called Chelsea “destructive anti-footballers” and compared the brutality of the 2012 defeat to Bayern’s 2-1 loss against Manchester United in the 1999 Champions League final. 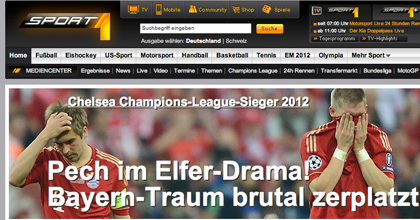 “Three-time runners-up, like Leverkusen in 2002 – this is the maximum punishment for the record champions,” added Bild. 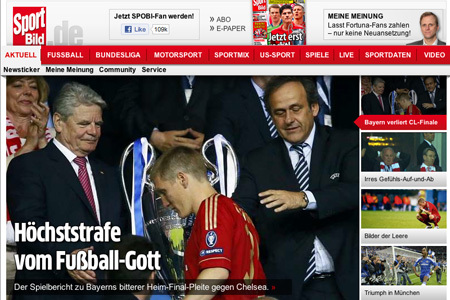 “How much bad luck fits into a single football match?” was the headline for the Munich daily Süddeutsche Zeitung. “The most one-sided final in Champions League history found a tragic end – FC Chelsea beat FC Bayern in dramatic manner in penalties. Munich give away chances enough for four finals within 120 minutes and finish second a third time this season,” started the SZ’s coverage. 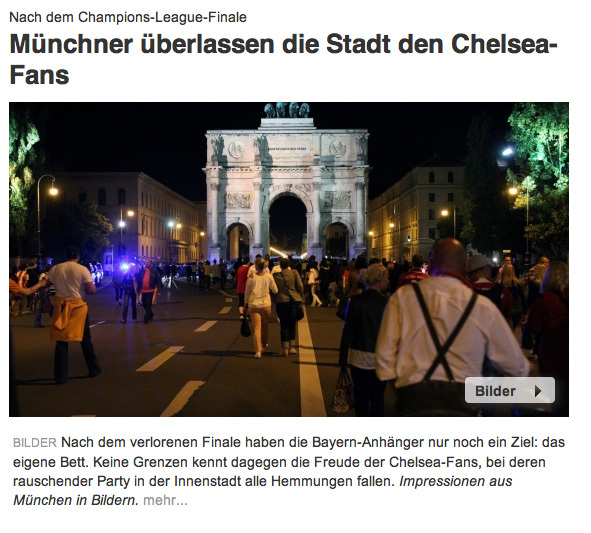 The SZ also had a picture gallery of the city after the Bayern loss with the headline “Munich people cede city to Chelsea fans”. The bi-weekly magazine Kicker titled their coverage: “Penalties drama: Drogba becomes Bayern nightmare”. 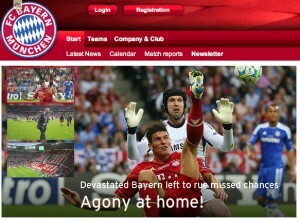 And Bayern’s English website titled their coverage: “Devasted Bayern left to rue missed chances”. Chelsea played like a small team against superior opposition. The kind of game you get when a championship club plays them at Stanford Bridge in an FA cup game. Mourinho once lambasted Tottenham for “parking the team bus in front of the goal”. I wonder what he thinks of Chelsea now. But Chelsea do deserve this because Bayern were so bad at the final ball. Robben should hang his head in shame but at least he tried. 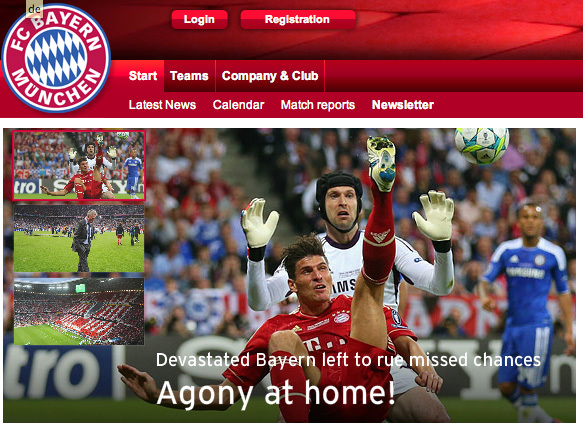 Gomez, Ribery and all those other muppets let Bayern down. Still it’s a poor way to win the cup but it’s still won. It’s just painful seeing that cheat and foul person Drogba being happy. Chelsea were playing away in a final. And even with that massive unfair advantage Bayern couldn’t win. Chelsea deserved it. Muhammed Ali didn’t often win by a knockout – but often win he did and that’s why people remember him – nobody remembers the losers and their name is not on the cup! As to Drogba – a great guy and a role model for his fellow countrymen, does massive charity work for them – pleased to see him so, so happy, as I am. You would expect Bayern Munich to be dominant whilst playing at home but just remember Chelsea had some key players missing through suspension, e.g. Ivanovic, Terry, Ramires and Meireles! To win in Germany is a huge accomplishment, it’s the score line that matters when the final whistle is blown, regardless of how a team has won. Bayern didn’t deserve to win; but this was a game that Bayern lost. To have so much possession and to miss such easy chances is inexcusable. Chelsea are a very negative side. They didn’t create a single decent chance on the night. Bad night for football. Terry is a racist spiv and Drogba is one of the most over-rated players of the last ten years. 2. Chelsea needed to neutralise this advantage. They could not afford to go behind. So they had to be uber cautious. 3. Fussball is not synchronized Swimming or Diving…or Ballroom Dancing. Point are not awarded by a Referee or Judge for doing pretty things. It is about overcoming your opponent. It is about TACTICS and the execution of them…….Chelsea got their tactics right and have their name on the Trophy. There is no shame, only Glory! The Glory of winning, in this case in unfavourable conditions. They achieved the desired outcome. They displayed the greatest virtue, TENACITY. @Fred, It’s a hard pill to swallow you idiot,terry wasn’t even playing, terry like him or not has been one of the best centrebacks in Europe for the last ten years, as by him being voted into the European team of the year by europes coaches 3 times. Drogba well let’s compare him to another top European striker over the same period, say Thierry Henry. (sic) henry missed two clear chances in the final against barca, erm drogba one chance one goal, drogba nine finals, nine goals. henry five finals goals=0, then when he got fed up with winning nothing he jumped.on the barca gravy train. Would you ever see him in his own area defending a corner, don’t be silly, henry was to much of a prima Donna, at least drogba knows what teamwork is, bayern were better going forward but not defending or taking pens. Face chelsea scored a word class goal from their only corner,robben only lasted three seasons at chelsea because he is a bottler. Chelsea football club champions of Europe.